Soprano Graciela Rivera was born in Ponce on April 17, 1921 the seventh of eight children of church minister-cabinetmaker Gonzalo Salvador and his dear wife Enriqueta Padilla. In 1952 she became the first Puerto Rican singer to be engaged in a leading role by the prestigious Metropolitan Opera in New York, prominent venue for the world’s greatest voices. Later that same year, she was the first woman ever invited to sing from Mexico’s Basilica Our Lady of Guadalupe in a special nationally broadcasted TV program. At the Met, the distinguished Julliard School graduate won an impressive 7 curtain calls in her title role debut of Donizetti’s Lucia di Lammermoor. “Her tones were pure, clear and beautifully modulated from the start and there were indications that she was going to be a real hit when the applause after her legend of the fountain aria caused a pause in the show. But it was after the mad scene that the cheers and the applause really broke loose.” reported the New York Times. “The best thing that has come along in the coloratura line since Lily Pons” claimed the San Francisco Chronicle. In 1953, Rivera was proclaimed "Citizen of the Year" by the City of New York. Also known as The Nightingale of Puerto Rico, our coloratura soprano went on and successfully built an extraordinary 50+ years career in Europe, the United States, and Latin America. Radio City Music Hall, Madison Square Garden and Carnegie Hall in New York, as well as the Teatro Reale dell’Opera di Roma and Teatro San Carlo di Napoli are just a few of the opera venues honored with her pristine performances. 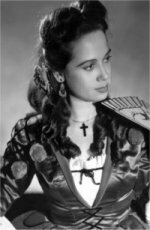 Always unpretentious in spite of her world-class artistic achievements, Graciela Rivera even had a private meeting with Pope Pius XII during her 1950 Italian tour. In the early seventies, Rivera was appointed Assistant Professor at the City University of New York (CUNY) where for 15 years she taught the History of Puerto Rican Music, among several other college courses. She was also instrumental in presenting the first Puerto Rican opera “Nela”, by local composer Manuel B. González, as protagonist and artistic director. In the nineties, she was justly bestowed with Honoris Causa Doctorate Degrees by both Ponce’s Pontificia Universidad Católica de Puerto Rico and by New York’s own Lehman College. 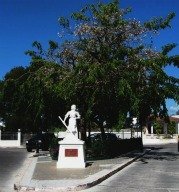 On 2006 Ponce’s small but charming Triangular Park at Aurora Street was honorably re-named after its illustrious daughter with a humble plaque and statue officially proclaiming it as the Graciela Rivera Park . Despite some disturbing information about her “death” (appearing at Wikipedia and other internet sources) retired Graciela is very much alive and resides with her daughter Virginia in New Jersey and will be hopefully celebrating her 90th birthday in April 2011.